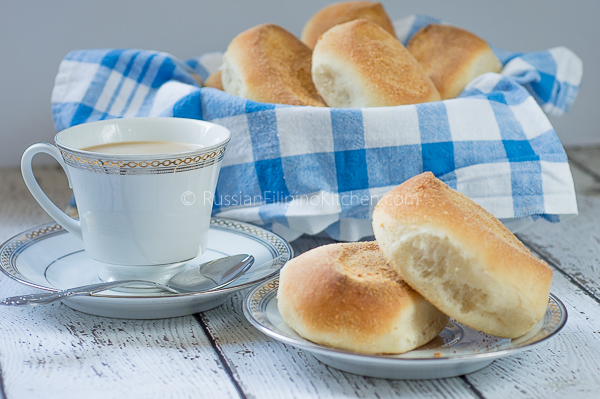 This bread roll is so popular among Filipinos that anyone growing up from northern to southern Philippines knows what it is. Bakeries all over the country always have hot pandesals for sale especially mornings and afternoons when they’re widely consumed. I have memories of eating pandesal dunked in hot coffee or tsokolate (Filipino chocolate beverage made from pure cacao) and enjoying every moist bite. Sometimes during breakfast when my mom made omelets, I’ll stuff some of them in between the bread. Oh it was yum! When I moved to the US, finding pandesal for sale is difficult. I am yet to find a place or bakery that sells this bread in Sacramento area. Because I really miss this crusty-on-the outside soft-on-the inside bread rolls, I was determined to learn how to make it. I’ve made a fairly good pandesal a few years ago but lost the recipe so I went online, read recipes and watched videos on YouTube and experimented with baking the bread. I found some good recipes but most of them uses eggs. I have nothing about pandesal containing eggs but I just wanted to make the classic pandesal recipe, also known as lean pandesal, without adding eggs. So I tweaked my favorite everyday white bread recipe and came out with this simple and easy recipe. This is a no-egg pandesal but mind you, the resulting bread is crusty on the outside and soft and fluffy on the inside. Also, they remain soft up to 3 days provided you store them in an airtight container like a zip-top bag. It’s actually very easy to make pandesal. Never fear and do not get intimidated. 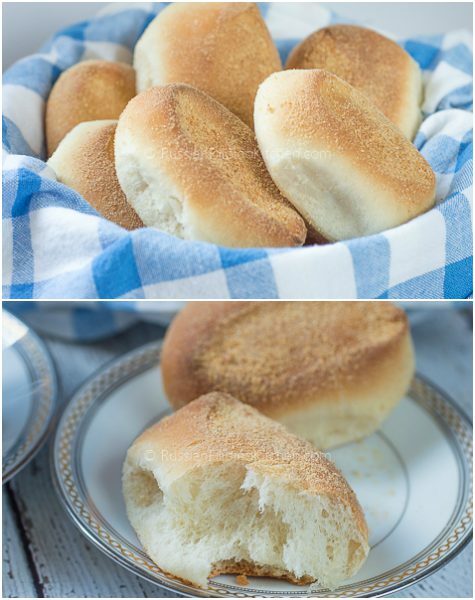 After a few attempts making these rolls, I finally discovered a foolproof recipe that works. You just have to know some basic knowledge about bread doughs and how yeast works. I do not have any professional experience in baking, but from what I learned baking at home, you have to pay attention to every step of the process. FIRST, make sure that you are using a good quality flour. I’ve tried both bread flour and all-purpose flour for this recipe. Although I prefer using bread flour for breads due to higher gluten content resulting to fluffier bread, you can also use all-purpose flour without problem. SECOND, make sure the yeast you are using is alive. 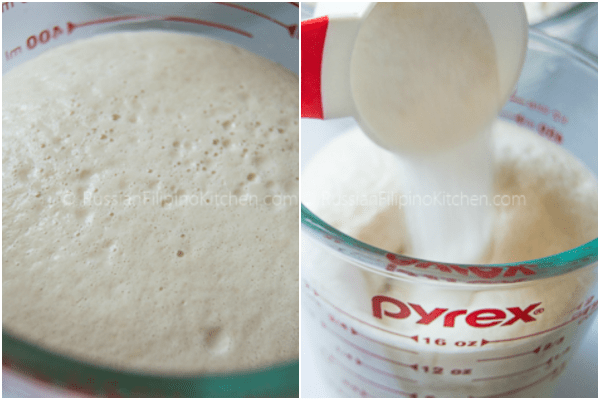 I use two kinds of yeast in baking: active dry and rapid rise. The difference between the two is active dry yeast needs to be proofed or activated before you can add it to the dry ingredients. It’s the process where you add it to a warm liquid and some sugar then let it stand for couple of minutes until it becomes frothy/bubbly. Rapid rise yeast doesn’t require activation, therefore you can directly add it to the dry ingredients. Take note that using rapid rise yeast makes your dough rise faster versus using active dry yeast, therefore reducing proofing time. THIRD, humidity in the air where you live has an effect on the bread dough. You need to pay attention to the consistency of the dough in case you need to add flour or water. If you have to adjust the ingredients, do so but slowly add about a tablespoon at a time until it is just *right*. FOURTH, make sure you knead the dough properly in order for the gluten to develop. Gluten is the protein in the flour that creates the structure in the dough that traps the carbon dioxide gases released by the yeast as they breath. Think of this structure as a matrix that holds the gases from escaping, therefore making the dough rise or increase in volume. A well-kneaded dough should be soft, elastic, and springs back when you poke it. FIFTH, give the dough enough time to proof. In other words, make sure they double in volume as required. Most recipes will specify the number of hours required for the dough to rise. Use them as guidelines but always go with your eyes. There are many factors that affect the dough’s rising time which include the temperature in your kitchen. Doughs rise faster in a warm environment so if your kitchen is cold or drafty, it takes a much longer time for the dough to rise to the required volume. SIXTH, make sure you don’t poke the dough during the second rising (when pandesal is doubling in volume and getting ready for the oven). This deflates the gas (CO2) and causes the dough to collapse. Also, avoid dropping or banging the baking sheet on a hard surface, or doing unnecessary movements causing the dough to collapse. SEVENTH, make sure to keep an eye on the pandesal as they are baking. They’re done in 10 minutes or less. It’s also important to turn the baking sheet around halfway through baking for an even browning on the bread crusts. I believe I’ve covered the important things in order to make this pandesal bread making a success. So let’s move on to the step-by-step instructions. 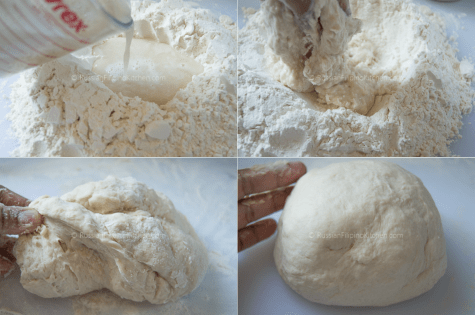 Take note that I will include 3 ways how you can form the dough which include manual kneading and using a stand mixer with a dough hook attachment. Use the method that is most convenient for you. Happy baking! 1. Mix water, 1 tsp sugar, and yeast in a mixing bowl. Set aside until it gets frothy, about 10 minutes. 2. Once the yeast is activated, pour in the remaining sugar and oil and stir. 3. Meanwhile, mix the flour and salt together in a separate bowl. 4. A.) Mixing the dough by dumping the flour onto a flat surface and creating a well in the center. Reserve about 1/2 cup of the flour and dump the rest onto your clean counter or any flat kneading surface. With your fingers, create a well in the center of the flour, then slowly pour in the yeast mixture. Use your fingers to slowly mix the wet and dry ingredients together until a soft dough forms, adding a little more flour, as needed. Knead the dough by stretching and folding it repeatedly using the heel of your hands until it gets soft, smooth and elastic. Add the remaining flour slowly at a time while kneading until it no longer sticks to your fingers or onto the surface. Click to watch a video on how to knead dough by hand. 4.B. )Mixing the dough inside a mixing bowl. Reserve about 1/2 cup of the flour and place the rest into a mixing bowl. 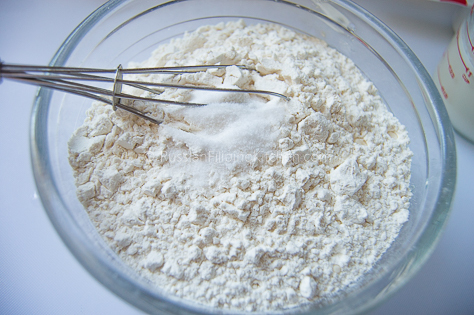 Create a well in the center of the flour, then slowly pour in the yeast mixture. Use your fingers or a spatula to slowly mix the wet and dry ingredients together until a soft dough forms, adding a little more flour, as needed. 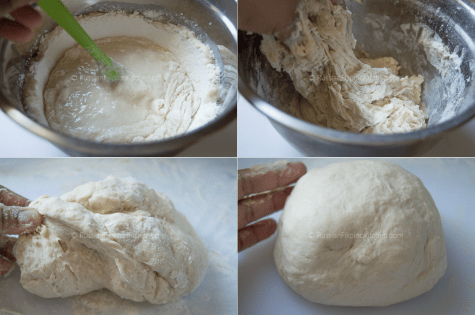 Transfer the dough onto a clean flat surface, then hand-knead by stretching and folding it repeatedly using the heel of your hands until it gets soft, smooth and elastic. Add the remaining flour slowly at a time while kneading until it no longer sticks to your fingers or onto the surface. Click to watch a video on how to knead dough by hand. 4.C. )Mixing the dough using a stand mixer with a dough hook attachment. 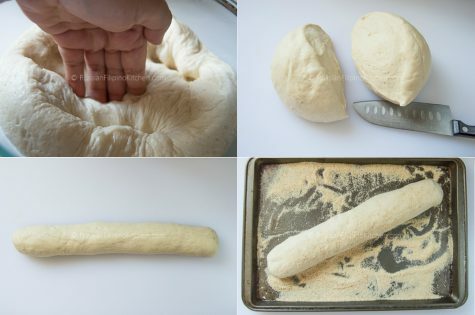 This is the easiest method to kneading the dough since all you have to do is place the wet ingredients first into the mixer’s bowl, turn the appliance on at medium speed, and slowly adding the flour in at 1/2 cup increments until a soft, smooth, and elastic dough forms. 5. Grease a large mixing bowl and place rounded dough inside, turning once to coat the other side with oil. Cover with a plastic cling wrap or clean kitchen towel and place in a warm environment free from draft. Allow to double in size about 1-2 hours. 6.While the dough is rising, line a large baking sheet with parchment paper or silicone baking mat. Also, prepare another baking sheet and add the bread crumbs. Set aside until ready to use. 7.After the dough has doubled in volume, punch with your fingers or knuckle to let some of the gases out. Transfer to a flat surface and divide the dough in half, working on each half one at a time. Roll dough into a log about 10 inches long and 1 1/2 inches thick, then coat with bread crumbs. 8. 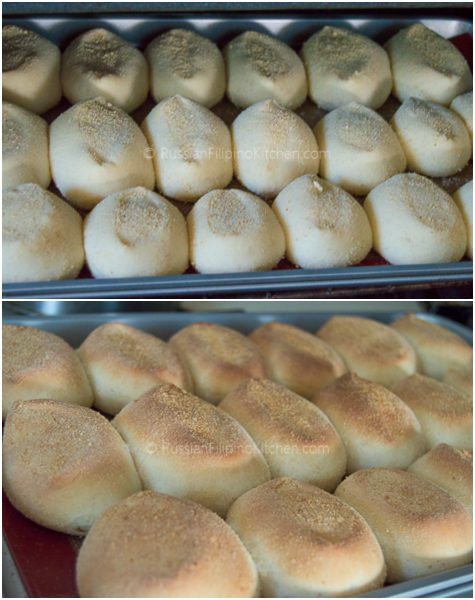 Cut into 1-inch rolls then coat individual pandesal with bread crumbs. 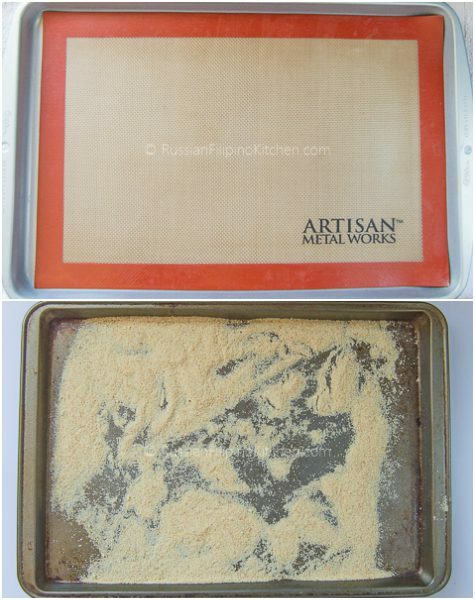 Arrange on a single layer onto a baking sheet lined with parchment paper or silicone baking mat spacing 1/2 inch apart. Cover with kitchen towel and allow rolls to double in size from 1-3 hours depending on the warmth of your kitchen. The rolls should look puffy during the second rise. 9. Preheat oven to 375ºF (190ºC) and once the desired temperature is achieved, bake pandesal on center rack for 8-10 minutes turning baking sheet around halfway to ensure even browning. Bake until just golden in color. 10. Serve warm. To ensure freshness, store pandesal in airtight container such as ziploc bags at room temperature. They’ll remain soft up to 3 days. 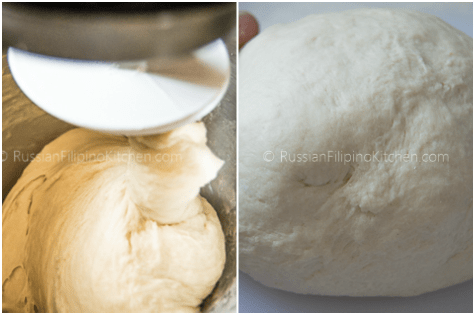 Classic Filipino pandesal recipe also known as "lean pandesal" without the addition of eggs. They are crusty on the outside but soft and fluffy on the inside. Mix water, 1 tsp sugar, and yeast in a mixing bowl. Set aside until it gets frothy, about 10 minutes. Once the yeast is activated, pour in the remaining sugar and oil and stir. Meanwhile, mix the flour and salt together in a separate bowl. A.) Mixing the dough by dumping the flour onto a flat surface and creating a well in the center. Reserve about ½ cup of the flour and dump the rest onto your clean counter or any flat kneading surface. With your fingers, create a well in the center of the flour, then slowly pour in the yeast mixture. Use your fingers to slowly mix the wet and dry ingredients together until a soft dough forms, adding a little more flour, as needed. Knead the dough by stretching and folding it repeatedly using the heel of your hands until it gets soft, smooth and elastic. Add the remaining flour slowly at a time while kneading until it no longer sticks to your fingers or onto the surface. Click to watch a video on how to knead dough by hand. B. )Mixing the dough inside a mixing bowl. Reserve about ½ cup of the flour and place the rest into a mixing bowl. With your fingers, create a well in the center of the flour, then slowly pour in the yeast mixture. Use your fingers or a spatula to slowly mix the wet and dry ingredients together until a soft dough forms, adding a little more flour, as needed. 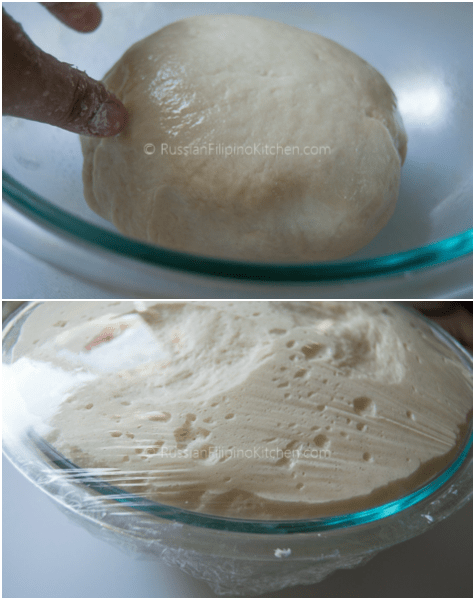 Transfer the dough onto a clean flat surface, then hand-knead by stretching and folding it repeatedly using the heel of your hands until it gets soft, smooth and elastic. Add the remaining flour slowly at a time while kneading until it no longer sticks to your fingers or onto the surface. Grease a large mixing bowl and place rounded dough inside, turning once to coat the other side with oil. Cover with a plastic cling wrap or clean kitchen towel and place in a warm environment free from draft. Allow to double in size about 1-2 hours. While the dough is rising, line a large baking sheet with parchment paper or silicone baking mat. Also, prepare another baking sheet and add the bread crumbs. Set aside until ready to use. After the dough has doubled in volume, punch with your fingers or knuckle to let some of the gases out. Transfer to a flat surface and divide the dough in half, working on each half one at a time. Roll dough into a log about 10 inches long and 1½ inches thick, then coat with bread crumbs. 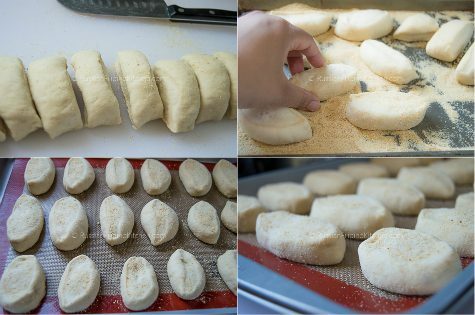 Cut into 1-inch rolls then coat individual pandesal with bread crumbs. Arrange on a single layer onto a baking sheet lined with parchment paper or silicone baking mat spacing ½ inch apart. Cover with kitchen towel and allow rolls to double in size from 1-3 hours depending on the warmth of your kitchen. The rolls should look puffy during the second rise. Preheat oven to 375ºF (190ºC) and once the desired temperature is achieved, bake pandesal on center rack for 8-10 minutes turning baking sheet around halfway to ensure even browning. Bake until just golden in color. Serve warm. To ensure freshness, store pandesal in airtight container such as ziploc bags at room temperature. They'll remain soft up to 3 days. oh wow!! i have been waiting for someone like to give directions in making good pandesal ?? never poke the dough on the second rising ??? Yeah!!!??? Hello Jackie! Thanks for checking out my pandesal recipe. Yes, the gas within the dough makes the bread airy, so for the final rising avoid puncturing the dough. Hello! Thank you for the recipe. I like the idea of lean pandesal very much. I have a question as I’m new to baking. When you measure the flour, do you scoop and level or scoop it right out of the bag? My dough became very sticky not sure if it’s because I scooped and leveled it (this may have caused it to be less flour?) I think I may have added 1/4 to 1/2 cup of flour (doing a tbsp at a time). It was hard to handle it until I’ve added more flour. Thank you for your help! Hello Shirley! Welcome and thank you for stopping by First of all, I’d like to apologize I haven’t seen your comment until now. It went into the Spam folder…Regarding your question, I scoop and level when measuring. 3 cups of flour usually is all I need for the dough. Adding 1/4 to 1/2 cup is alright. Just add gradually until the dough no longer sticks. Hope you had success in baking! Thank you for sharing this recipe. I’ve already tried it a couple of times, usually subbing 1/2 C of ground oats for added fiber and my son can’t get enough of the doubled recipe. I also had to scale down the yeast to 3.5 t to lessen the yeasty flavor. Today, I’m trying to be brave to try baking it in slow cooker instead. I’m not in the mood for rolling and shaping. 🙂 I’m crossing my fingers that this can also be a good one for a sliced bread of sorts. Wow, subbing with ground oats actually is a great idea; I haven’t thought about that! Thank you, I will try that soon! How’s the bread baked in the slow cooker? Hope it turned out good! Ok, thank you! I will try one more time and will let you know. Have a great day! By the way you recipes all look yummy. I looking forward to trying them. Welcome Shirley! And thanks for the feedback! Hi. I made this recipe this past weekend and did not have enough time to post a picture. They were gone! This recipe was really good. The taste was excellent. Thank you for providing the recipe. I will use this again. Wow thanks Jane for the feedback! Please share the recipe to others. hello, Im just asking if you dont need egg, butter baking powder for your pandesal as what i read in other recipe? Hi Jocelyn! 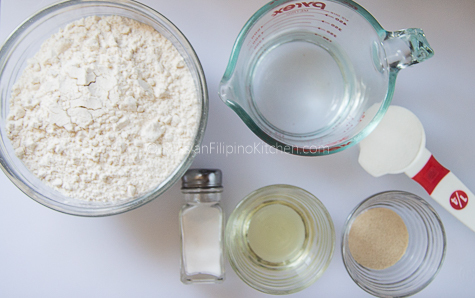 This is a lean pandesal recipe which doesn’t use any egg, butter, or baking powder. Tnx for the recipe I made my pandesal perfect! I want to post the picture of my pandesal but how??? Anyway tnx! I made it! Do you have an instagram account? If you do, you can post a photo of the pandesal over there and tag me @russianfilipinokitchen or hashtag #russianfilipinokitchen in your post. If don’t have it, email me @ russianfilipinokitchen at gmail dot com and send me the photo. I will post your pic in our FB page. Hi, thank you for sharing your recipe. I’ve been looking for a recipe of a lean pandesal, and I found yours and I tried it, t’was my 1st time to bake a bread. It was perfect and yummy, I found the taste, I was looking for. Thank for the notes also. Hi mia, thanks for your recipe i did twice already the first time i did, is i follow your recipe, the second time i did i add plain greek yogurt and comes very nice and soft. I take out 3 tbs of water and replace 1 tbsp of yogurt. Hi I just want to be clear about the yeast how many grams or teaspoon? That’s correct. 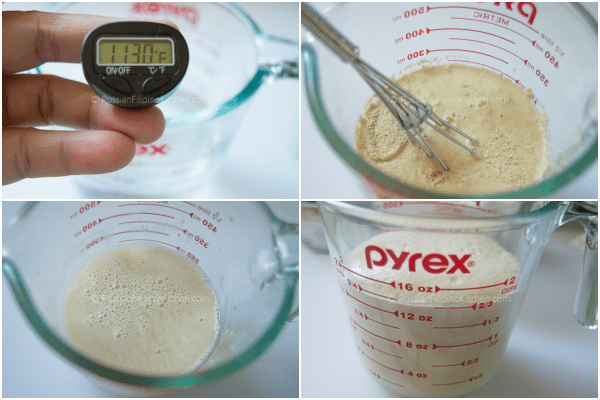 If you are using instant dry yeast, there is no proofing needed. Mix everything together including water. Remember that you cannot form dough without liquid. Then follow everything else in the recipe. Good luck! Hi Carissa! Thanks so much for linking back. I’m glad the pandesal turned out great. I will try using whole wheat next time. Hi.. my pandesal did not achieve the golden brown color after baking. Hello! Maybe you need to adjust the baking time? Try baking a few minutes longer. There’s a variation in temperature among different ovens. Check pandesal while it’s baking and pull them out only when they have achieved the desired color. Can I use butter in my mixture? Id like it to be buttery-soft. Hello! This recipe is for lean pandesal, so there is no butter, eggs, or milk. You can check out my recipe for cinnamon rolls. The dough is very soft and fluffy. Shape the dough like pandesal and bake as directed. I haven’t tried using butter for this recipe, so I can’t tell you the result. hi. can i add the instant dry yeast into the flour,the mix and add the sugar the mix again?